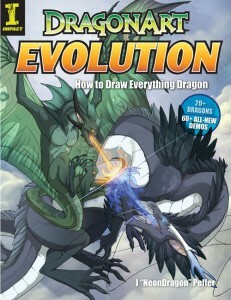 DragonArt Evolution: How to Draw Everything Dragon by J "NeonDragon" Peffer. (Grades 5+) Impact, 2010. 143 pages. Review copy provided by publisher. If your library kids are anything like my library kids, dragons are all the rage. With the popularity of books like Eragon, How to Train Your Dragon, and Dragonology, we are hard-pressed to keep a dragon book on the shelf. Add the adults that wander down to your department looking for pictures of dragons and I think you'll find that DragonArt Evolution: How to Draw Everything Dragon fits the bill quite nicely. The book starts with a few drawing basics - creating basic shapes and arranging them to loosely outline a dragon shape. It goes on to discuss choosing colors and some do's and don'ts about design. Then it goes into dragon anatomy - eyes, jaws, ears, horns, wings - giving many examples of different kinds of each. With so many different examples, kids can really be creative with how they design their dragons. And gave it a go. What do you think? I didn't finish it, but I can buy that if I wanted to spend the time to learn how to draw dragons, this book would help me out! The book might be a little difficult for elementary students, but I think middle-schoolers and high-schoolers who are into dragons will find great tips. The book features many different kinds of dragons - Western and Eastern, even zombie dragons. It's Nonfiction Monday! Head on over to Madigan Reads for this week's roundup!